Experience the ultimate Namibian adventure, on a 13 day custom exploration of the wild! Your journey begins in Windhoek, before continuing on to various campsites and lodges for unique stays and irreplaceable memories. Your opportunities for thrilling excursions, simple relaxation, and cultural immersions will make this safari unforgettable. Observe the fascinating wildlife in their natural element and admire the stunning landscapes, as you drive yourselves between each adventure. Welcome to Namibia! After landing at Windhoek International (Hosea Kutako) Airport, located 40km outside Windhoek, you will be greeted by our local representative. 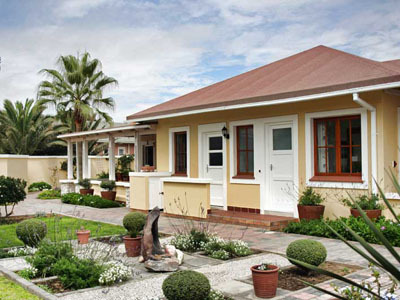 You will then be transferred by road into Windhoek and to your guest house, the Galton House. You will also be provided with everything you will need for your self-drive safari; from your accommodation vouchers to a map marked with your route and a full safari briefing. At the guest house you will also receive your rental vehicle (a 4x4 Toyota Land Cruiser HJ 200 4x4 Station wagon with reduced excess insurance; ZAR/NAD 2000 excess) and receive a full vehicle briefing – please ensure that you have your driver’s license, credit card, and passport on hand to complete the vehicle hire documents. Dinner this evening is for your own account to give you the option to either dine at Galton’s in-house restaurant or out at one of the restaurants in town. *** Please Note: There is a foreign exchange desk at Windhoek International Airport if required on arrival. We recommend that you opt for South African Rand rather than Namibian Dollars as both are legal tender in Namibia, however Namibian Dollars are limited to use and exchanging only within Namibia. Windhoek is the modern gateway city into Namibia's wilderness. With its gardens, parks, buildings and relaxed atmosphere, this well-kept city would not seem out of place in America or Europe. Unlike so many other African cities, tourist-centric shops are confined to a few specific streets, so walking through most of Windhoek can feel like you aren't a foreigner at all, but merely another local taking a leisurely lunch break, or running errands. You may have flown all the way to Namibia to experience expansive deserts, rolling dunes, or African wildlife, but you will definitely need to find your way out of WIndhoek to do it. As an entry and exit point to/from Namibia however, you can't ask for any better. After breakfast you depart Windhoek in your rental vehicle and drive onwards to arrive at Hoodia Desert Lodge, where you will stay for two nights whilst you explore the remarkable sights of the Namib Desert. The rest of the afternoon is at leisure at Hoodia Desert Lodge to enjoy your scenic desert surroundings and relax by the pool. Lunch on arrival is included for you. At optional extra you can select to join a guided sundowner drive with Hoodia on their property. This place, this isolated, dry, epic, desolate place, is why you came to Namibia. Sossusvlei is a sea of red sand unlike any other, seemingly transplanted directly from Mars. Sunrises and sunsets light the sand on fire, and constant wind causes landscapes to change entirely, ensuring that no two visits to Sossusvlei are the same. Any native life one finds here is barely clinging to the term, and long-dead trees are often the only break in landscape. Make no mistake, Sossusvlei is one of the most beautiful places you will ever see, though your definition of beauty may be changed by your time here. This morning you will need to rise early for a captivating guided Sossusvlei excursion as arranged with Hoodia Desert Lodge. You would enter the park at sunrise and capture the dunes whilst the light is soft and shadows accentuate the towering shapes and curves. This area boasts some of the highest free-standing sand dunes in the world and your guide will give you an insight on the formation of the Namib Desert and its myriad of fascinating creatures and plants that have adapted to survive these harsh environs. Once you have explored Sossusvlei, Deadvlei and surrounding dune fields to your heart’s content you can enjoy a relaxed picnic brunch in the shade of a camel thorn tree. You then return to Hoodia Desert Lodge in the early afternoon, with the rest of the afternoon at your leisure (from experience, this is usually welcomed after an exhilarating morning in the dunes). The fascinating drive today takes you northwest through awesome and ever changing desert landscapes of the Namib Naukluft National Park, including the impressive Gaub and Kuiseb canyons. You will meet the coast at the port town of Walvis Bay, where you have the option to visit the lagoon to see the interesting mix of pelicans, flamingos and other seabirds, before continuing north to Swakopmund where you can enjoy the pleasant seaside location and cooler coastal air. This afternoon you have the option to explore the shops, waterfront and craft market as appeals, before heading out for dinner at one of the popular restaurants in town. Dinner this evening is on your own account as there are a number of excellent restaurants to choose from. We recommend that you avoid a stay in Swakopmund over a weekend, as most shops close by Saturday afternoon and only a select few open on a Sunday. However, restaurants will be open and tours will be on offer in the morning over weekends. Today is at your leisure to spend exploring Swakopmund, Walvis Bay and surrounding areas. You may like to climb the coastal dunes at Langstrand or Dune 7, explore Swakopmund’s shops, cafe's, museums and waterfront, or partake in any of the adventure activities on offer such as sand-boarding, boat cruises, kayaking, and scenic flights (all at extra cost). We recommend joining a morning dolphin and seal catamaran cruise on the Walvis Bay harbor and lagoon this morning, where you will see seals, pelicans, and flamingos amongst other marine life, and hopefully, you will also see Heaviside and Bottlenose dolphins. Oysters and South African bubbly are served on board, along with other beverages and snacks. Another option would be to explore the desert area by taking part in the fascinating and informative “Living Desert Tour”. This Desert Tour concentrates on exploring the local dune belt between Walvis Bay and Swakopmund, taking special care not to damage the gravel plains and cause any unnecessary damage to the dune eco-system. Also highly recommended is a half or full day excursion into Sandwich Harbour, the most important wetlands and feeding area on the west coast of Southern Africa for many migratory birds. Today you continue your self-drive journey, passing Namibia’s highest mountain, the Brandberg which peaks at 2,573 m above sea level, and take time to view game and absorb the vastness of the scenery along the way. Damaraland is typified by displays of colour, magnificent table topped mountains, rock formations and bizarre-looking vegetation. The present day landscape has been formed by the erosion of wind, water and geological forces which have formed rolling hills, dunes, gravel plains and ancient river terraces. It is the variety and loneliness of the area as well as the scenic splendour which will reward and astound you, giving one an authentic understanding of the word 'wilderness'. Today you join on a scheduled morning activity, which departs after an early breakfast into the ephemeral Aba Huab River valley to explore this remarkable region and to search for game, especially the elusive desert adapted elephants if they are in the area. Damaraland is home to a variety of desert adapted wildlife and hidden desert treasures. You will normally then return to camp for lunch and a well-deserved siesta and enjoy an afternoon activity as on offer at Mowani. Desert Adapted Elephant: In habitats with sufficient vegetation and water an adult elephant consumes as much as 300 kg of roughage and 230 liters of water every day of its life. Consider what a herd of them would eat and drink in a week or a month or a year. Finding an African elephant in a desert? Well, yes and not only elephant, but other large mammals as well, such as black rhinoceros and giraffe. Their ranges extend from river catchments in northern Kaokoveld as far south as the northern Namib. Apart from the Kunene River, seven river courses northwards from the Ugab provide them with possible routes across the desert, right to the Skeleton Coast. The biggest are the Hoarusib, the Hoanib, the Huab and the Ugab Rivers. Desert adapted elephant in Kaokoland and the Namib walk further for water and fodder than any other elephant in Africa. The distances between waterholes and feeding grounds can be as great as 68 km. The typical home range of a family herd is larger than 2,000km², or eight times as big as ranges in central Africa where rainfall is much higher. They walk and feed at night and rest during the day. To meet their nutritional and bulk requirements they browse on no fewer than 74 of the 103 plant species that grow in their range. Not a separate species or even a subspecies, they are an ecotype unique to Namibia in Africa south of the equator, behaviourally adapted to hyper-arid conditions. Elephant in Mali on the southwestern fringe of the Sahara Desert are the only others known to survive in similar conditions. Today you continue on your self-drive safari and drive to southern Etosha to the Andersson’s Camp. Andersson’s Camp also boasts two very productive floodlit waterholes, which are renowned to be very lively during the day and at night (in view from the dining room). Especially exciting is the underground hide to enjoy a different view point of the animals frequenting the waterhole. Today you enter the Etosha National Park (gates open sunrise) and explore and stop over at the various waterholes in the hope of experiencing some exciting wildlife sightings. You can have lunch (for own account) at any of the rest camps inside the park. After your arrival at Onguma the rest of the day is spent at your leisure (very often this is welcomed since you have spent most of the day in the vehicle game driving in the park). 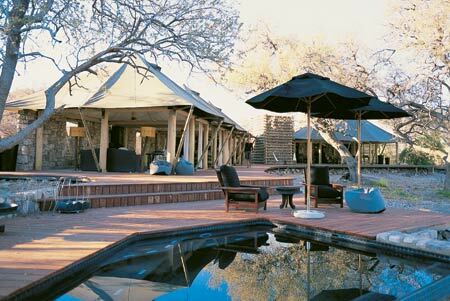 Onguma Game Reserve: Situated on the eastern side of Etosha and borders Fisher’s Pan. Onguma Game Reserve has more than 20,000ha of protected land and wildlife. The nature reserve boasts over thirty different animal species consisting of plains game including kudu, giraffe, eland, oryx, hartebeest, zebra, impala and many more roam freely, as well as predators such as lion, cheetah and leopard, being common residents of the area. Onguma Game Reserve is now also proud to be home to a family of black rhinos! More than 300 bird species can also be viewed at Onguma Nature Reserve. Today is available for you to have time to relax in lovely comfortable surroundings while still giving time to be spent game viewing in the National Park as much as appeals in your own rental vehicle, within park regulations. Onguma also offers a choice of additional activities you can book and pay direct, including a sundowner drive on the Onguma Reserve. A full day of wonderful activities as offered by Okonjima. You will rise early and have tea/coffee and a snack before departing on the morning guided activity. Return to camp for a hearty brunch with time to relax and enjoy your peaceful bush surroundings until the afternoon guided activity commences. AfriCat Foundation: Okonjima is home to the AfriCat Foundation, a wildlife sanctuary founded in 1991 that is dedicated to creating conservation awareness, preserving habitat, promoting environmental educational research and supporting animal welfare. Their main focus is Africa's big cats, especially injured or captured leopard and cheetah. AfriCat runs the largest cheetah and leopard rescue and release program in the world. In the last 17 years over 1 000 of these predators have been rescued with over 85 % being released back into the wild. Close encounters with leopard and cheetah are an unforgettable highlight. Activities include leopard tracking by vehicle, a visit to the cheetah welfare project, large carnivore tracking on foot including cheetahs, wild dogs and spotted hyenas, participation in the fun bushman trail and various self-guided walking trails. You will rise early this morning for another memorable guided activity before you return to Bush Camp for a sumptuous breakfast. After freshening up you will depart for Windhoek in the late morning, via the town of Okahandja, to arrive back in Windhoek in the mid afternoon. If time allows, you will have the option to visit the Woodcarvers Craft Market in Okahandja for some last minute curio shopping before continuing on to Windhoek. Upon your arrival in Windhoek you return your rental vehicle, in time for your ongoing international flight back home. This is officially the end of your Namibian Safari. We hope to see you again soon, Bon voyage…! Named after the famous explorer, Sir Francis Galton, Galton House has a relaxed, yet efficient style. Impressive wildlife photography adorns the walls, while the rest of the interior is a combination of modern minimalist and understated chic. A mere ten minute drive from the center of town and perched on the edge of Windhoek's northernmost affluent suburb of Eros, your stay here is guaranteed to be peaceful. There is Wi-Fi throughout the property and the eight guest rooms feature wired internet connectivity and satellite television. The communal areas consist of a spacious lounge, indoor and outdoor dining areas, a swimming pool, and gardens. A number of shops, restaurants and supermarkets are also located nearby. You are invited to experience the beauty and tranquility of Hoodia Desert Lodge, surrounded by majestic mountains on the banks of the Tsauchab River. A short 20 minute drive from the property will bring you to the Sesriem Gate, entrance of the world famous red sand dunes of Sossusvlei. At this intimate lodge, you are sure to meet enthusiastic people, keen to share adventures and make the most of this desert experience. The friendliness and personal attention of the staff ensures a memorable and comfortable stay. With limitless knowledge of the region, the guided tours are an ideal introduction to the magical world of the desert and its secrets. Cornerstone Guesthouse is a small, private and peaceful bed and breakfast situated within easy walking distance of the ocean and the town center of Swakopmund. Occupying a quiet corner of Swakopmund’s old town, near the aquarium and the old brewery, Cornerstone offers the charm and intimacy of a family run B&B combined with the modern amenities of a luxury hotel. Within a few minutes from the guest house you can walk to beaches, cafés, restaurants, lively pubs, Swakopmund tourist attractions and a variety of interesting shops and markets. All the rooms have en-suite bathrooms with large solar assisted showers and modern fittings. Peter and his team offer an inclusive breakfast with a fresh selection of fruits, juices, yogurts, breads, preserves and eggs and bacon cooked to order. Wash that all down with your choice of either freshly brewed coffee or tea, and you'll be ready to explore the attractions of Swakopmund and the Skeleton Coast. Mowani Mountain Camp consists of 12 luxury tents, all with en-suite facilities, decorated beautifully in East African style. The luxury tents are a great source of relaxation. Comfortably hidden in your own private hide-away, you will be pampered by crisp white linen, en-suite bathrooms, your own wooden deck offering an open view of the wonderful Damara landscape. Or you can choose a luxury thatched suite complete with butler service and furbished with a distinct African flavour. The private lounge is equipped with a music center and satellite television, complimented by private dining and bar facilities. Whether relaxing in the folds of your crisp white bed, enjoying a romantic dinner under the stars or throwing caution to the wind in the open-air bush bathroom. Andersson's Camp is located on the famous Ongava concession, a private nature reserve bordering the Etosha National Park. Surrounded by plains teeming with wildlife, and situated close to the largest saltpan in Africa, family-friendly Andersson's Camp takes its name from Charles Andersson, the Swedish explorer who first 'discovered' the Etosha Pan. The Discoverer atmosphere of Andersson’s Camp makes for a much more comfortable modern-day exploration of this landscape. The resurrected farmstead now forms the anchor fronting onto a thriving waterhole with a fantastic underground hide for unique wildlife viewing and photography. The recently established Onguma Tented Camp consists of seven luxury permanent tents, each overlooking the beautiful waterhole. The main complex also overlooks the waterhole and includes reception area, lounge, wine cellar, bar & dining area. The bird life in this area is outstanding with over 300 species having been recorded. The farm is also home to the largest breeding colony of white-backed vulture in Namibia. Optional activities include early morning and late afternoon game drives within the Onguma Concession as well as inside Etosha National Park, and also night drives on the concession area. Featuring a quintessential bush experience, the Okonjima Bush Camp, home of the AfriCat Foundation, offers a blend of safari elegance and modern comforts. 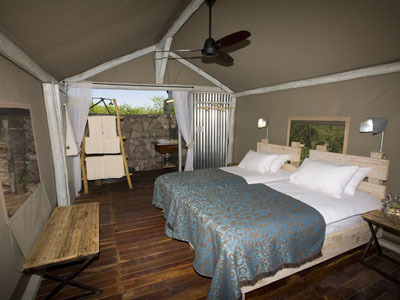 The property's spacious chalets open out onto the barren grass and acacia savannah. Each split level room has a day bed, bar, tea & coffee facilities. The exclusive chalets offer complete privacy under a unique thatched roof. You may want to sleep with the blinds open, making the most of the tranquil stillness of an African night. In front of each chalet, a birdbath is visited by a variety of birds and small mammals. The lodge also boasts a curio shop, cozy lounge, rustic indoor fire place, scenic outdoor fire place, kitchen and dining area, all of which overlooks the local waterhole and wildlife activity.